The miles of sandy beaches along the Pacific Ocean are a celebration of the Californian lifestyle with distinct neighbourhoods and oceanfront walks linking the communities. Malibu is popular with the privacy-seeking rich and famous and their mansions line strips of privately-owned shoreline; the wide sandy beaches, rocky outcrops and green open-spaces make Malibu the most scenic neighbourhood in LA. It presents the classic Californian beach babe image immortalised by The Beach Boys and Baywatch. 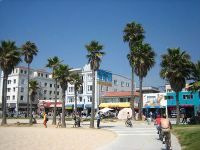 LA's premiere beach community, Santa Monica, is known for its alternative beachfront atmosphere, as well as its famous hideaway Hollywood residents. The palm-lined cliffs, once the location of the homes of Clark Gable, Joan Crawford and Greta Garbo, are today home to celebrities like Meryl Streep, Rod Stewart and Michelle Pfeiffer. The neighbourhood's famous landmark is the Santa Monica Pier, boasting old-world carnival attractions, including a wooden 1920s carousel with painted horses, and plenty of seafood restaurants. Third Street Promenade is a lively pedestrian mall bustling with buskers, street vendors, evangelists and original shops, and is the heart of Santa Monica's cafes, restaurants and bars. Venice is best known for its Ocean Front Walk that is a non-stop parade of jugglers, artists, vendors, musicians and joggers. Venice Beach provides a classic Los Angeles lifestyle experience where beautiful sun-bronzed bodies on bicycles and rollerblades cruise along the walkway to Muscle Beach, where the outdoor gym is packed with weightlifters flexing for the onlookers. The area is full of laid back cafes and restaurants, health food shops, bike and blade rentals, and second hand record stores.